Inspired by the lavish design synonymous with colonial Maharaja times, Asia Dragon brings you quality industrial & Indian sheesham furniture from India incorporating the style of the colonial industrial era along with traditional Indian Thaket, Jali, Sikar and hand-painted designs. 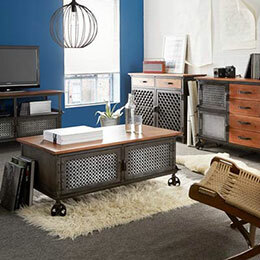 Solid reliable design makes our collections of Indian furniture a 'must have' for any dynamic living environment. 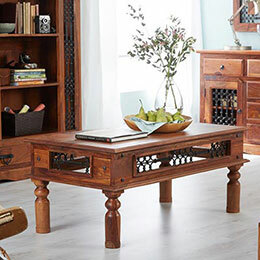 Fashioned from only the finest sustainable sheesham and mango hardwoods from sustainable plantations our furniture from India offers durable pieces that are hand-crafted for lasting usability and appeal. 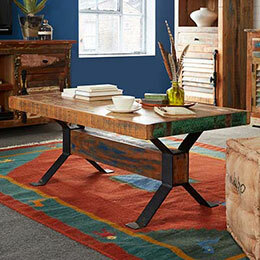 These collections are hand-crafted from sheesham and other recycled hardwood timbers which is both durable and dense and possesses a sumptuous colour and deep grain, along with upcycled iron & steel. 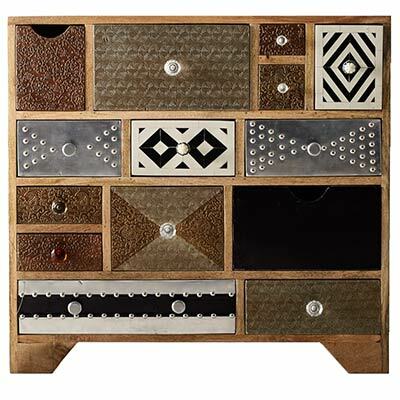 Any imperfections caused by the manufacturing process add to the character of this timelessly enigmatic furniture. 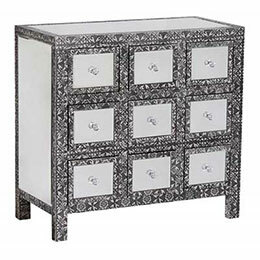 Bursting with charisma, it will infuse any room with an everlasting sense of charm. 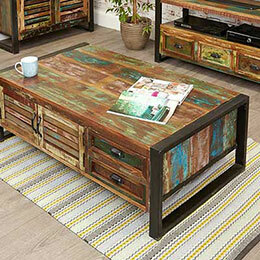 Perfect for creating that easten look in your living room, dining room or bedroom. Buy online - UK stock - Quick Delivery. 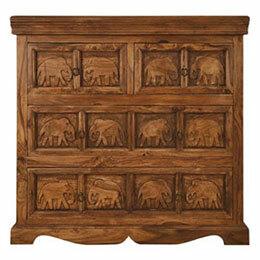 Timbers - We use a variety of the best quality timbers in the construction of our Indian furniture collections. Each timber is carefully selected from sustainable and managed sources in India. All timbers are solid and we manufacture using sheesham, acacia and mango. Wood care - Wood is a natural material and reacts to the environment it is in, do not place in direct sunlight or positions exposed to extremes of heat or humidity. Please do not use general household cleaning products. 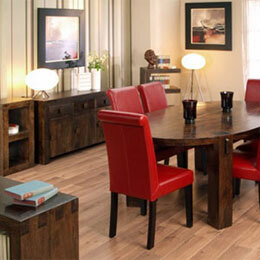 To care for your furniture we recommend the occasional use of a clear wax polish. Day to day cleaning should be just a dust and a wipe with a vinegar and water solution. Spills should be wiped away immediately, scratches can be covered using a coloured wax polish. Proper care will ensure lasting pleasure for many years to come. EU Timber Regulation - In March 2013 the requirements of the EU Timber Regulation came into force. This legislation prohibits the sale of timber on the EU market if it has been illegally obtained or harvested. To achieve this, it has set out measures which those trading timber within the EU must put in place to minimise the risk of illegal timber being sold. We have checked, and are confident that all of our suppliers comply with this legislation. Mangifera indica, otherwise known as mango, is a species of flowering tree belonging to the sumac and poison ivy family Anacardiaceae. It is found in the forests of India, Bangladesh and Pakistan where it is indigenous. In the last two millenia cultivated varieties have been introduced to other warm climate countries of the world. This tree is quite large and is capable of a growing to a height and crown diameter of about 30 metres and trunk circumference of around 4 metres. The tree is more widely known for its delicious fruit rather than for its timber. 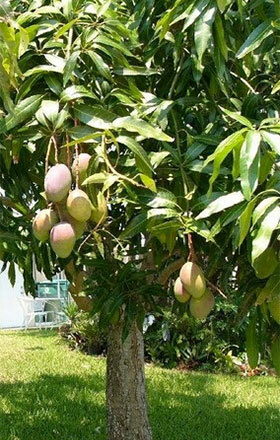 However, once a mango tree has ended its fruit bearing years it is ready to be converted to lumber. Why is mango so popular for cabinet making? Mango is extremely popular in the United Kingdom and is often viewed as a greener alternative to other timbers because they grow very quickly. Mango wood is one of the hardiest timbers in the world, with densely packed grains with the ability to resist knocks and bumps. Also, when finished, the wood has a lovely smooth and satisfying texture which is excellent for staining and waxing. 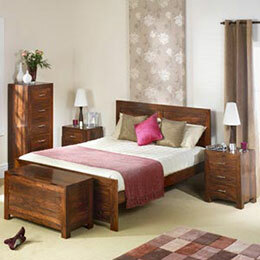 Acacia wood is derived from the acacia genus of trees and shrubs. They are native to Australia and South East Asia, Africa and parts of the Americas and is widely grown on sustainable Indian plantations. There are in excess of a thousand differing varieties of acacia tree. 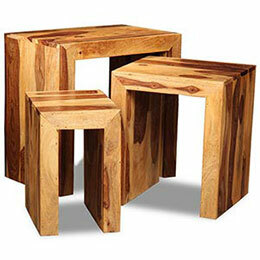 The hardwood that is obtained from the tree is suitable for making long-lasting items of furniture and home furnishings. Why is it good for making furniture? 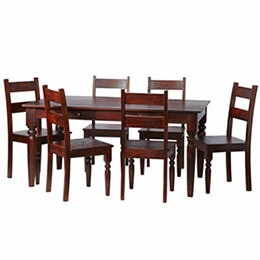 Acacia hardwood is smooth and silky to touch, especially if it has been polished. It is both highly durable and water-resistant, making it optimal for heavy-use items that are in recurrant contact with liquids. Even if acacia wood isn’t treated or protected in any way, it can endure for up to four decades. 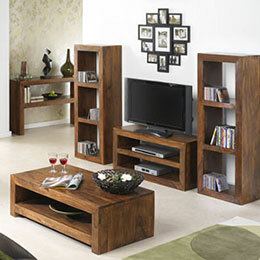 It is deep-brown in colour with an attractive natural grain, providing a warm, plush touch to any room. 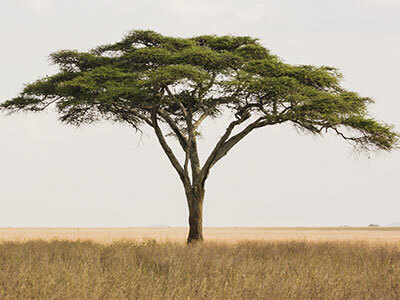 Acacia will not scratch easily whilst its water-resistant properties means it will not warp readily. 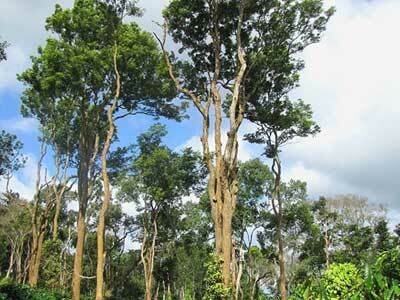 It is also highly resistant to fungus as acacia is naturally antibacterial. We humans have had a long relationship with wood. Our ancestors used it to clothe themselves, to shelter themselves and to feed themselves. For our survival, mankind used different ways of cutting and using different types of wood and so we started to recognize such skills as necessary. Because of this, various types of carpentry such as wood carvers and furniture makers came into being. 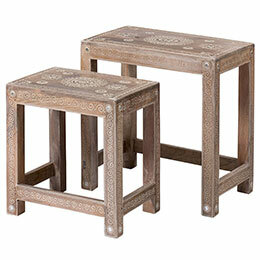 In India there is a long standing woodcraft history dating back many centuries. The roots of Indian joinery date back to the times of the Vijayanagar Empire (1336AD) from southern India. In those times wood craftsmen were highly respected and endorsed by the royal rulers. They considered it to be both a trade and an art commissioning many ornate pieces for their palaces and public buildings. 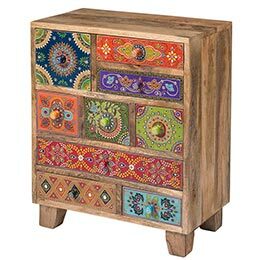 Even today, artistic woodcraf can be found everywhere in India; on furniture, wood doors, pillars, wall panelling in buildings ancient, old and modern plus in the most impressive Indian temples and shrines. Wooden craftwork is found in every city, town and village across this giant land. Being strongly influenced by the art and literature of ancient India, carpentary carries with it numerous important implications. Carving and woodcraft has enabled us to see an insight into the history of India capturing legends and folklores in a time capsule made of robust hardwood. This has helped preserve ancient cultures and will ensure their continuity into the future. The hardwoods used were and still are typically sheesham, mango, ebony wood and walnut; with ebony being the royal symbol of the south and walnut the representative symbol of the nothern provinces. Wood is used extensively in India for construction of temples and houses to interior fixtures, furnishings, ornamants and everyday objects and toys. The timbers utilised are often locally found or grown on sustainable, managed plantations. 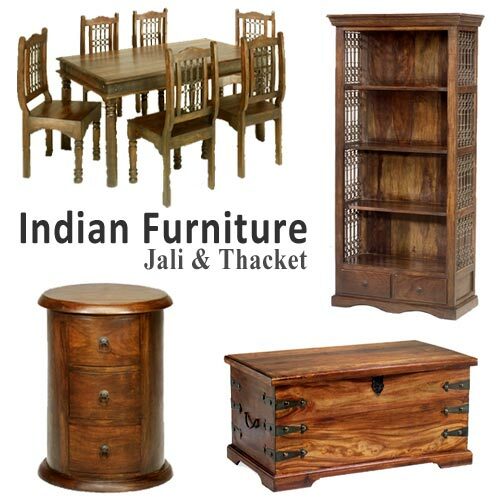 For furniture, hardwood is used to create beautifully decorated antique reproduction or contempoary modern cabinets, tables, chairs, bookcases, trunks and beds; still utilising the ancient traditions of Indian carpentary. India has vast areas of fertile land, favourable weather conditions and skilled foresters which means a huge diversity of timers can be grown. 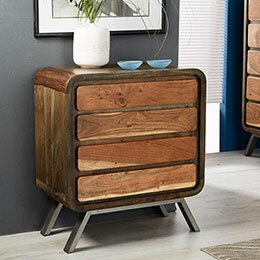 The variety of timbers readily available are sheesham or otherwise known as Indian rosewood, mango, teakwood, walnut, sandalwood and coconut wood. Sandalwood in particular, is considered by many Indian people to be a gift from their God because of its very long lasting fragrance. 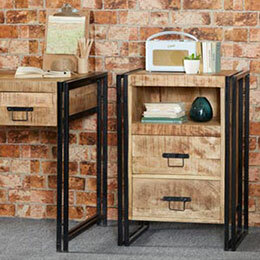 In stark contrast to the present recent developments and technology advances which has enabled computers and machines to do most of the work Indian furniture manufacturing still maintains it's traditional roots; utilising simple hand tools and time-less processes. As a direct and deliberate consequence their creations still oooze with ancient ethnic flavour and everlasting charm and due to the way the it is still constructed, using time tested methods, it is the symbol of durability and sturdy elegance.